The UK’s Gigabit Broadband Voucher Scheme is to be given a boost in Wales thanks to a new partnership between the Welsh and UK Governments. Ministers from both Governments are now urging Welsh businesses and communities to apply for the funding to get gigabit speeds. Although the vast majority of premises in Wales can now access superfast broadband, we are working hard on assisting the remaining five per cent that cannot access it and where commercial companies have no plans to reach. There is no one size fits all solution to reach the final premises, and the Gigabit Broadband Voucher scheme is an important part of a suite of measures to achieve this. This voucher scheme can provide a vital funding source for group connectivity projects, and could be of great benefit to communities currently without access. I’m pleased we’ve been able to work with the UK Government to provide an enhanced scheme for Wales, taking into account the particular challenges we face here with geography and the location of premises. Improved connectivity for homes and businesses in Wales is at the centre of the UK Government’s efforts to strengthen our economy and support our rapidly expanding digital sector. This voucher scheme will ensure more people in Wales have access to reliable broadband speeds, marking another significant leap forward in both governments’ efforts to ensure Wales has a broadband network fit for the future. 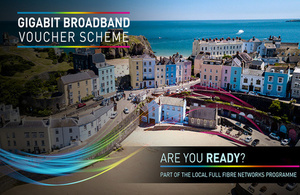 The enhanced Gigabit Voucher Scheme will replace the Ultrafast Voucher scheme in Wales, which provided an average of £4,300 per scheme. Group projects are when two or more businesses get together - or businesses with residents - to combine their vouchers towards the cost of building the infrastructure for installation. Up to ten residents can get together with one business to create a group of community project.